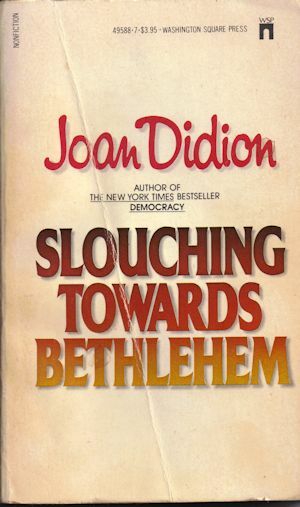 Joan Didion (born in 1934) still has an excellent reputation and her essay collection Slouching Towards Bethlehem has held up as a modern classic of American journalism. Finding it in a Goodwill I took it home, began to read and to my chagrin was very soon bored stiff. Five essays in and all my enthusiasm was gone. I was close to bailing on it and so picked up my notebook to explain my dislike – very soon discovering that it was more interesting to talk about than it was to read. Hence, this review is the first I’ve ever made not to “spread the news” but just to get through the work in question. Part of the problem is that Joan Didion seemed enormously depressed while at work on these essays. 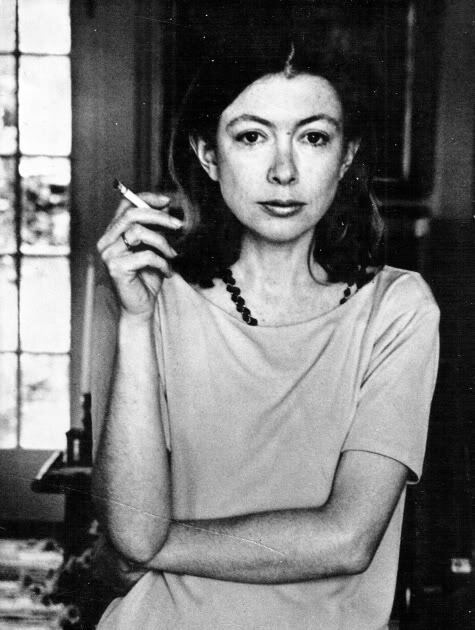 Most of them are very short and while reading I developed this picture in my mind of Didion, brow furrowed, writing slowly and painstakingly, chewing on the inside of her mouth, writing them all as if on commission (though she states only five out of twenty were). Slouching Towards Bethlehem is divided into three parts, the first called “Life Styles in the Golden Land” and focusing its gaze upon the political and social life of average Californians. She offers item after item – John Wayne, a communist cell, Howard Hughes – and focuses on the most miniscule and insignificant aspects of them – table talk, behavioural tics, anecdotes. She offers a depressed shoegazer’s view of America and thus every essay is filled with banal, expressionless observation – and price tags. It gets dull before too long, livened up only by a brief report on Vegas marriages and “Slouching Towards Bethlehem” itself. The existential despair comes in waves off this little book and nowhere more so than in the title essay, a set of observations on the Haight-Ashbury drug scene that is justly famous: sharp-edged, slightly humorous, and extremely compelling. In it she pans back, zooms out so that the big picture is briefly available before plunging back into claustrophobic conditions. Of course the activists – not those whose thinking had become rigid, but those whose approach to revolution was imaginatively anarchic – had long ago grasped the reality which still eluded the press: we were seeing something important. We were seeing the desperate attempt of a handful of pathetically unequipped children to create a community in a social vacuum. Once we had seen these children, we could no longer overlook the vacuum, no longer pretend that the society’s atomization could be reversed. This was not a traditional generational rebellion. At some point between 1945 and 1967 we had somehow neglected to tell these children the rules of the game we happened to be playing. Maybe we had stopped believing in the rules ourselves, maybe we were having a failure of nerve about the game. Maybe there were just too few people around to do the telling. These were children who grew up cut loose from the web of cousins and great-aunts and family doctors and lifelong neighbors who had traditionally suggested and enforced the society’s values. They are children who have moved around a lot, San Jose, Chula Vista, here. They are less in rebellion against the society than ignorant of it, able only to feed back certain of its most publicized self-doubts, Vietnam, Saran-Wrap, diet pills, the Bomb. The above paragraph was more horrifying to me than the infamous one about people feeding acid to their kids (scarcely a widespread phenomenon then or now). This is not just a set of reflections on the sixties. Rather there is the feeling that Didion could see what was happening and took the notes, that this book was a line drawn in the sand and to read it now is to see how far America has gone since crossing it. As a social critique all these essays put together are really something, numbing though they are to read. The “Personals” section is more generally engaging as Didion focuses more on her own self and the result is easy for me to empathize with, especially her essay “On Self-Respect” and its absence, which she writes of with great insight. To do without self-respect…is to be an unwilling audience of one to an interminable documentary that details one’s failings, both real and imagined, with fresh footage spliced in for every screening. There’s the glass you broke in anger, there’s the hurt on X’s face; watch now, this next scene, the night Y came back from Houston, see how you muff this one. To live without self-respect is to lie awake some night, beyond the reach of warm milk, phenobarbital, and the sleeping hand on the coverlet, counting up the sins of commission and omission, the trusts betrayed, the promises subtly broken, the gifts irrevocably wasted through sloth or cowardice or carelessness. However long we postpone it, we eventually lie down alone in that notoriously uncomfortable bed, the one we make ourselves. Whether or not we sleep in it depends, of course, on whether or not we respect ourselves. She also contemplates the concepts of home and morality, everywhere showcasing that not a lot has changed since the 60s, tying back to the political essays and social disintegration. I can see why this book made such an impact when all of the issues were cutting-edge and I’m more curious than I’d care to admit to know her thoughts on the modern manifestations of things falling apart. “Seven Places of the Mind” is the final and best section, all essays dealing with landscape and confirming all my earlier suspicions of the writer’s state at the time. Even Hawaii couldn’t cheer her up. In fact the smallest possible reprieve comes only in her brief description of a visit to Alcatraz – out of commission and peaceful – which is the only essay she seems to have taken a little pleasure in creating: …I tried to imagine the prison as it had been, with the big lights playing over the windows all night long and the guards patrolling the gun galleries and the silverware clattering into a bag as it was checked in after meals, tried dutifully to summon up some distaste, some night terror of the doors locking and the boat pulling away. But the fact of it was that I liked it out there, a ruin devoid of human vanities, clean of human illusions, an empty place reclaimed by the weather where a woman plays an organ to stop the wind’s whining and an old man plays ball with a dog named Duke. The other places include the decaying society of old Sacramento, a trip through the desert to Guaymas, Los Angeles, New York (she perfectly captures the magic of the place) and Newport: Even as the sun dapples the great lawns and the fountains plash all around, there is something in the air that has nothing to do with pleasure and nothing to do with graceful tradition, a sense not of how prettily money can be spent but of how harshly money is made, an immediate presence of the pits and the rails and the foundries, of turbines and pork-belly futures. I recall being told, when I first moved to Los Angeles and was living on an isolated beach, that the Indians would throw themselves into the sea when the bad wind blew. I could see why. The Pacific turned ominously glossy during a Santa Ana period, and one woke in the night troubled not only by the peacocks screaming in the olive trees but by the eerie absence of surf. The heat was surreal. The sky had a yellow cast, the kind of light sometimes called “earthquake weather.” My only neighbor would not come out of her house for days, and there were no lights at night, and her husband roamed the place with a machete. One day he would tell me that he had heard a trespasser, the next a rattlesnake. Final thoughts? I can’t claim a total dislike of this book – I respected it too much for that. It’s a modern classic and most people seem to enjoy it very much but since all I see are sadness and depression in its pages, I can’t. Perhaps I missed something or read too much into it. I’m very glad I didn’t bail on it, that’s for sure, but I don’t know if I’ll be reading any more of her stuff.